Lucapa Diamond Co. has recovered the first diamonds from the new commercial treatment plant at the Mothae mine in Lesotho. 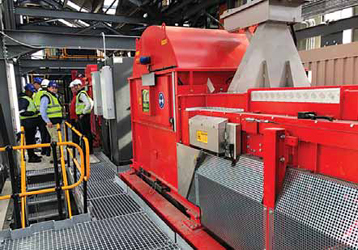 The plant incorporates advanced diamond recovery technology, including two X-ray transmission diamond recovery modules designed to recover large and rare Type IIa diamonds ahead of the secondary crushing circuit. The system will reduce potential diamond breakage and improve the recovery of unbroken large stones. Shortly after startup, the plant recovered a 78-carat white diamond. The plant will be progressively ramped up to its designed 1.1-million-metric-tonper- year (mt/y) throughput capacity following implementation of a second plant operating shift. The Mothae mine is owned 70% by Lucapa and 30% by the government of Lesotho. Mining is based on a well-defined kimberlite pipe with a surface area of about 8.8 ha and a JORC-classified diamond resource of more than 1 million carats to a depth of 300 m at an average modeled diamond value of $1,063/carat. Production from Mothae will complement production from the Lulo mine in Angola (Lucapa 40% owner and operator), which produces the world’s highest average $/carat alluvial diamonds. Lucapa operates the Lulo concession in partnership with Angola’s national diamond company, Empresa Nacional de Diamantes E.P. (Endiama), and private partner Rosas & Petalas.